The Smooth A35T has received great reviews since its introduction, due to the fact that it packs all of the top features from different ICON Fitness machines into one powerful treadmill. 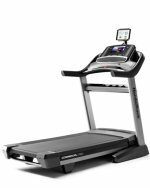 With incline, decline, tons of workouts and comfort features, it's really hard to beat for the price. The A35T features a full color touch screen offering feedback such as speed, distance, heart rate, incline, decline and calories burned. It features a comfortable runner's belt with Energy Return cushioning and folds easily with SpaceSaver design. 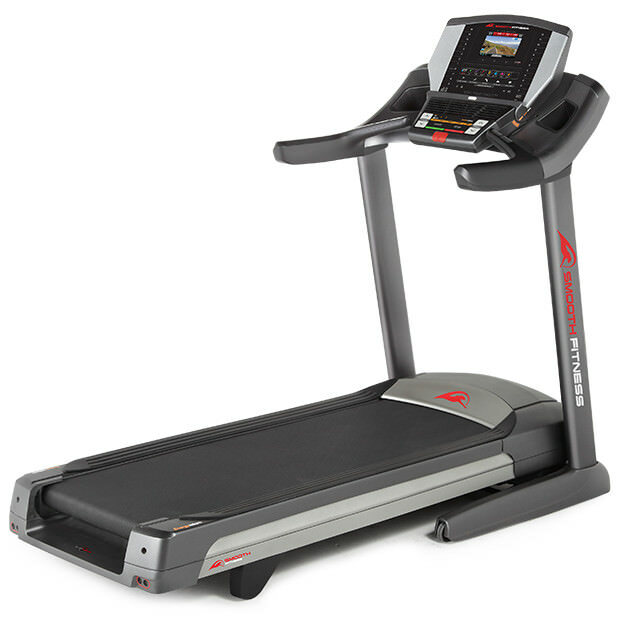 Get the popular Smooth A35T treadmill on sale now! The Smooth A35T is a big step up from the base 800 model, with many more features making it a solid choice and a mainstay on many top picks in the price range. There are a lot of things that stand out on most expert reviews. For starters, decline is something typically reserved for pricier machines. Now that Smooth is part of ICON Fitness, you find things, like decline capability, that the treadmills didn't previously have. It's interesting to note that this machine has many of the same features as the Epic A35T, also an ICON Fitness brand that has since been discontinued. So it looks like they brought over all of the great features that made that one quite popular in its day. Critics like also like the powerful yet quiet 3.5 CHP motor, the Energy Return Cushioning, the hi def workout videos that you can watch right on the console and the fact that you can easily fold up and store these ellipticals. Some of the other nice touches that users will appreciate on the A35T are the adjustable console, the bright, user-friendly touch screen and iFit, a full suite package that gives you additional workouts, tracking and sharing capability and the ability to work out anywhere worldwide with Google map integration. Families will appreciate the SafeZone technology, which sends out an alert and shuts down the treadmill if children or pets approach the machine. This is a nice feature that you don't find on many machines. The Smooth A35T is probably our favorite in the series, with the right combination of price and features. We love to do incline and decline training and if you can do both, even better. There are a ton of workout options between the built-ins, the high def videos and iFit to last a lifetime, and the motor is strong enough for any kind of workouts you might like to do. You can also listen to music while you work out with iPod compatibility. Smooth also pays attention to design and comfort details, which is something that is often overlooked in the price range. You get advanced cushioning in the belt, easy folding, adjustable console and a CoolAire workout fan. The only thing missing on this machine is web capability...for that you'll have to bump up to the 890 model which is about $500 more and comes with an HDTV as well. But besides that, the A35T has just about everything you could ever ask for in a treadmill under $1500.